"One Happy Island." This, the official motto of Aruba, is plastered on each taxi's license plate. 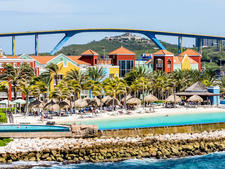 Surely Arubans are happy to see cruisers: Aruba's economy is fueled by tourists' dollars, and much of the island is heavily developed for them -- perhaps even more so than neighboring islands Bonaire and Curacao. (Together, the three make up what's known as the ABC chain of islands in this deepest part of the Southern Caribbean.) Most Arubans speak English and accept U.S. currency, and shops located in and around the port area are American -- Tommy Hilfiger, Diamonds International and the like. Beyond that, Aruba has a rich, layered heritage. The first people to inhabit the island were a nation of Arawak Indians. 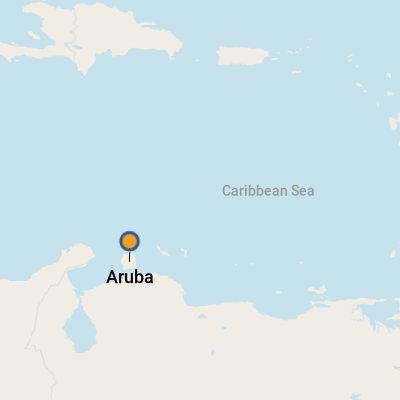 (The name Aruba seems to have derived from the Arawak Indian word oibubai, which means guide.) In 1499, the Spanish explorer Alonso de Ojeda laid claim to the territory for Queen Isabella. Nearly 200 years later, the Dutch captured the islands of Aruba, Curacao and Bonaire from the Spanish, and much of that heritage can be seen in its pastel Old World architecture. But let's face it -- we don't come here for the history. We come here for the diversions, and Aruba is the Caribbean's theme park. There are casinos, duty-free shops, more than two dozen dive sites, noteworthy shipwrecks and a championship golf course, lined with cacti and populated by friendly iguanas. Aruba's trademark divi divi trees always point in a southwesterly direction (due to trade winds that blow from the northeast), but we like to think they're leading the way to the sandy beaches that ring the island in the shape of a cheery smile. Best of all, there really is no bad time to visit Aruba. Located only 20 miles north of Venezuela, temperatures are consistently pleasant (lows in the 70s, highs in the 80s), there's no "rainy" season, and its location is far below the Atlantic hurricane belt, so it's less likely to be impacted by storms. Aruba's dry climate is home to large mondis (forests of cacti), and you may feel like you are in Arizona, rather than the Caribbean! You'll be anchored in downtown Oranjestad, Aruba's capital city. The terminal features the Tourism, Culture and Heritage Information Center, phones, ATMs and small souvenir shops. Great shopping, dining and bar-hopping are within walking distance of the dock. Several malls are located right across the street from the terminal, and a stroll along the waterfront is a great way to take in the Dutch colonial architecture and tropical pastels. If you are planning on driving, use caution on the roads, as some international signs may be unfamiliar. (Driving is on the right side of the road.) Also, exercise the same common sense and safety as you would in any foreign location, particularly if your ship stays in town late and you decide to walk into town at night. On Foot: It's an easy five-minute walk from your cruise ship to downtown shops and restaurants; a trip to any of Aruba's beaches requires a taxi or car ride. By Taxi: Taxis are readily available on the dock; they do not have meters, so be sure to settle your fare up front. Fares are listed on signs at the terminals. A ride from downtown to Palm Beach takes about 10 minutes from the terminal. If you want a two-hour island tour, you can fit up to five people in a car for one flat per-car rate. Renting a Car: There are several car rental companies in Aruba; Royal Car Rental (+297 587 7900), Smart Rent a Car (866-581-0785) and Speed Car Rental (297-582-8045) have locations at the cruise terminal. The best way to self-explore the terrain is by Jeep. Editor's Note: You should have no problem renting a car without a reservation -- but the Jeeps do go first, so either debark the ship as early as you can, or book ahead of time. By Bus: If you want to get out of town but don't feel like paying for a taxi or rental car, the hourly public buses that run from Oranjestad to Malmok or Arashi also make stops in front of all hotels along the beach strip (look for the L10 or L10A). The roundtrip fare is $2.30, and exact change is appreciated, though the driver will break U.S. and Aruban bills. The main bus terminal is right outside the cruise ship pier gate. The official currency is the Aruban florin, approximately 1.79 to the U.S. dollar. However, U.S. currency is widely accepted, and some banks' ATMs will even dispense it, including the Caribbean Mercantile Bank in the cruise terminal next to the information center. Most locals speak English, Spanish and Dutch, as well as Papiamento -- a language native to the ABC islands. If someone says, "Bon bini," he or she is welcoming you to Aruba. Water View: The Seaport Marketplace has a variety of eateries from which to choose. Gourmet Lunching: El Gaucho, Aruba's best Argentinean restaurant, is located in an atmospheric old-town house on the east end of Oranjestad (open daily for lunch and dinner from 11:30 a.m.). For Late Diners: If you are in town for dinner (some ships disembark as late as 11 p.m.), consider skipping your onboard seating for a meal at Pinchos Grill & Bar (L.G. Smith Boulevard 7). The outdoor eatery is casual but chic; there's a funky bar, lit with Starbucks-esque lamps, and seating for diners is located along the perimeter with fabulous views of the water. The restaurant is actually located on a pier under-lit by twinkling, blue lights. Grilled meats round out the menu (5 p.m. until midnight or 1 a.m. daily, except Monday; sunset happy hours occur daily from 5:30 until 6:30 p.m.). On the Beach: If you are spending the day on Palm Beach, stop for lunch at the Pelican Grill, set on a pier, over the water, behind the Pelican Tours outfit and near the Holiday Inn. It's not a fancy place by any means, but it's perfect for strolling in off the beach. The restaurant features a full bar (with a host of specialty drinks on the menu) and dishes from fresh fish sandwiches and burgers to a seafood platter costing more than $30. The ceviche appetizer is excellent. Open daily for lunch and dinner. Readers Recommend: Passions on the Beach at the Amsterdam Manor Beach Resort (J.E. Irausquin Blvd. 252) is a great choice for a romantic meal alfresco. Member Arubalisa writes, "Everything from the food to the service -- it was nothing less than perfect and a wonderful evening. Our table was closest to the water with torches and a lantern on the table. I can imagine how nice it would be at sunset." Grilled meats and fish are main events, and the menu features a seafood sampler platter with Caribbean lobster tail, shrimp, grouper and mahi-mahi. You can make reservations online. Lunch is served from noon until 4:30 p.m., happy hour is from 4 p.m. to 5 p.m., and you can get dinner from 6 p.m. until 9:30 p.m. The bar is open from 10 a.m. to 11 p.m. Try the legendary Pink Iguana -- a concoction of frozen strawberries, pineapple, rum and coconut cream -- at Iguana Joe's Caribbean Bar & Grill (right next to the port, open from 11 a.m.). Or throw back a Balashi, the local brew. The Southern Caribbean harbors the lion's share of the region's islands. But, because many are smaller and less developed than more easily accessible northerly ones, they tend to be less traveled. And that's a big plus for been-there, done-that cruisers eager to experience new ports of call. The region, which includes islands lying east and south of St. Maarten/St. Martin, has always been a bit more exotic than its Western and Eastern Caribbean counterparts. That's due, in part, to strong colonial influences that endure. Indeed, Martinique, Guadeloupe and St. Barts are part of the Republic of France; Curacao, Aruba and Bonaire are part of the Netherlands; Dominica, Antigua and Barbuda retain a British colonial legacy; and farthest south, just off the coast of Venezuela, Trinidad and Tobago exude Latin flair. These influences guarantee an interesting mix of natural beauty and culture. Aruba and Antigua are regarded for their soft, sandy beaches. Martinique, St. Lucia and Guadeloupe wow visitors with spectacular scenics, from rainforests to volcanoes. 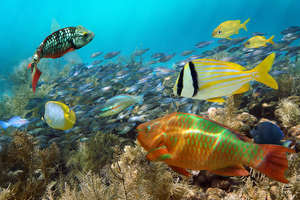 Dutch-influenced Curacao and its sibling, Bonaire, host great snorkeling and scuba diving spots. St. Barts is so French, you'll swear you're in the Mediterranean while sipping a glass of something at a sidewalk cafe. 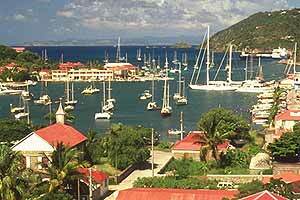 Martinique and Guadalupe also harbor both French and West Indian trappings. Grenada, relatively undeveloped, is laidback and exudes a genuine small town vibe. Opportunities to go (quite literally) off the beaten path abound on islands such as Dominica, where the countryside is so lush, the foliage is in and of itself, an attraction. In contrast, the ABC islands (Aruba, Bonaire and Curacao) are arid and sandy, but have their own stark beauty. With its cultural diversity and geographic variation, the region is bound to appeal to all types of travelers. The French Caribbean islands offer an experience that blends laid-back relaxation with a sophisticated vibe.